In new analysis released ahead of the IMF and World Bank Annual Meetings in Bali, Indonesia, Jubilee Debt Campaign show that China accounts for one-fifth of external debt owed by African governments. Recent news reports have claimed that China is responsible for causing new debt traps on the African continent. The new figures show that China’s role as a lender on the continent has indeed been growing, but its relative importance is less than often stated, especially in regard to countries currently in debt crisis. 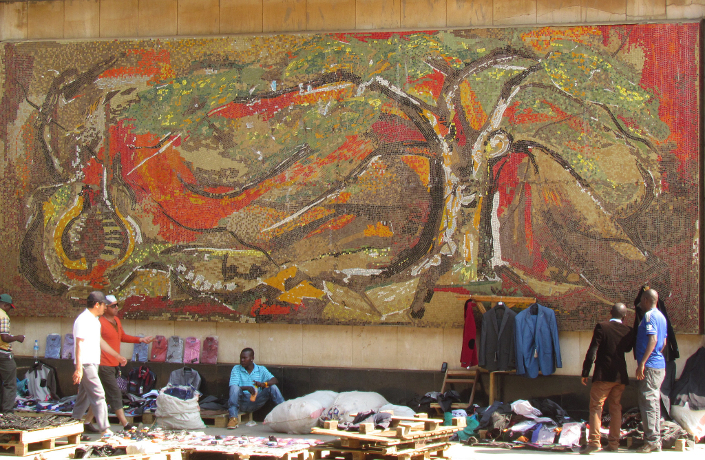 Street sellers in front of a mural in Lusaka, capital of Zambia. Zambia is one country in debt crisis where China is a significant lender, accounting for 30% of Zambia’s debt. But 50% is owed to private lenders, mainly under English law (Photo David Brown / Flickr). The briefing, ‘Africa’s rising debt crisis: Who is the debt owed to?’ shows that debt problems are increasing rapidly for many African countries, with average government external debt payments doubling in two years, from an average of 5.9% of government revenue in 2015 to 11.8% in 2017. The briefing also shows that of external debt owed by African governments, around 20% is owed to China, 35% is owed to multilateral lenders, 32% to private lenders and 13% to other governments. However, interest rates tend to be higher on private sector loans, which therefore account for 55% of interest payments, compared to China which accounts for 17% of interest payments. The briefing also investigates who debt is owed to by the countries that currently have the greatest debt problems. Of the 16 African countries rated by the IMF as in debt distress or at high risk of being so, on average 15% of their debt is owed to China. China is therefore on average a less significant lender in debt crisis countries, than across the whole continent. The data in the briefing comes from the IMF, World Bank and the China-Africa Research Initiative at John Hopkins University (CARI). The full briefing is available here.